This has got to be the best headline of the day so far. 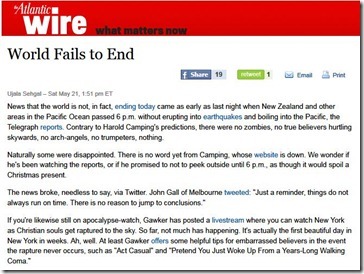 It’s not World Lives On, Despite Cult Stupidity, but World Fails to End. Yep, that’s us, Fail on a planetary scale. This entry was posted in Calamity, gonzo life by Kyle Kimberlin. Bookmark the permalink. Yeah. Well, the state of our culture at least. The world just kept spinning in its greased grooves, oblivious to us. As it should be. But we took a break from the usual denials and diversions to watch a few of our jabbering kind fling their poop around the monkey house. That's entertainment. That such an event–rather, nonevent–is the best news of the day says oodles about the state of our world, doesn't it?